The Sock-eez makes it simple and easy to remove socks, stockings and hosiery without straining a muscle. It is an assisted daily living dressing aid, developed and designed for those who suffer from Lymphodema, Deep Vein Thrombosis, Arthritis and Edema. 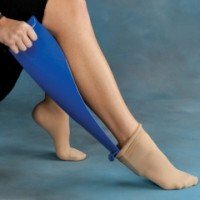 The elderly and the physically challenged also benefit from the use of this remarkable, ergonomic dressing aid that removes the thickest and tightest compression hose with one easy strain free motion. Never have trouble removing your compression socks and stockings again. The new and innovative Sock-eez makes it simple and easy to remove socks without straining a muscle. Great for athletic socks, knee-highs and traditional dress socks too!Sock-eez Features:Ergonomically designed to ease the pain and frustration for anyone experiencing the difficulty of removing compression hosiery or socks.Sock-eez Specifications:Size: 20 inches long.